Hope, you read my previous articles on the Out of Browser application development and have confident building application. In those articles you have seen that I wrote code for installing the OOB application from browser window. Now imagine some scenarios where you want to install the Silverlight application (XAP) using your Installer silently without the user interaction. How can you do that? Silverlight 4 now came up with that feature for you. In this article I will describe it and after reading it you will be able to install your Silverlight OOB Application (XAP) silently in your local drive and can run it from the desktop or startmenu without opening the browser. 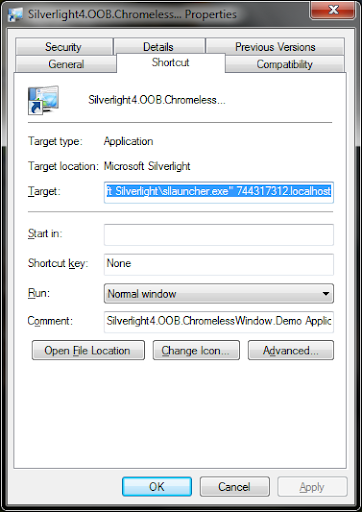 How Silverlight Out-of-Browser application works? Let's come to write some scripts to install your XAP silently as out of browser Silverlight application. Hope, you have a Silverlight application configured as out of browser. Build the application & you will get the output file (.XAP) in the ClientBin of the web application. Copy this file to your local drive in a specific folder (say, C:\MySilverlightApps\). I am using my Chromeless Window Demo Application and hence the complete path of the XAP is: "C:\MySilverlightApps\Silverlight4.OOB.ChromelessWindow.Demo.xap". If you have come this far, it means that you liked what you are reading (Silverlight 4: Installing Out-of-Browser application silently).